With more than 14,000 customers and 8 million users worldwide, MSDSonline is the most trusted cloud-based chemical management software solution on the market. We've helped thousands of businesses like yours across virtually every industry to ensure the safety of their workplaces, and streamline compliance with global hazard communication and chemical safety requirements. When you partner with VelocityEHS, you're partnering with an innovator in chemical management software. We're transforming chemical management by making critical information more accessible to employees than ever before through the use of mobile technologies. 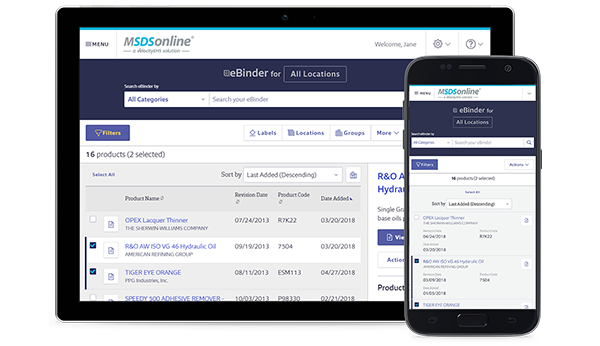 Our MSDSonline SDS / Chemical Management Mobile App syncs with your MSDSonline Account to provide easy, anytime access to safety data sheets, product summaries, chemical inventory information and more, even when you're offline, right from your smart phone or tablet. Request a Demo to learn more!